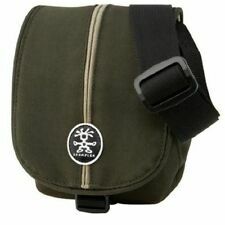 Crumpler Messenger Boy half backpack in green. In excellent used condition. Paypal payment only please. Dispatched with Royal Mail Signed For. 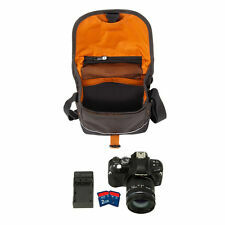 Crumpler DZPS-010 Doozie Photo Sling Camera Bag With 9.7” Tablet Compartment. Deep red and orange Fits semi-professional SLR with mid sized zoom lens, flash, accessories, tablet Outer size 36 x 25 x 21cm Inner size 35 x 24.5 x 16cm Camera compartment 34 x 21 x 14cm - this can be removed from the bag and has moveable partitions Volume 9L Weight 590g Condition is lightly used so as new Dispatched with Royal Mail 1st Class. Fully removable photo pouch with extra padding and internal dividers. Padded flap for gear protection with zip pocket. 3 internal slip pockets and new quick access front pocket. Chicken Tex Suprem hyper performance nylon. 19 x 23 x 15cm on the outside with long adjustable strap, suitable for shoulder or across the body. Interior pocket is approx 16 x 16 x 10cm. The Hospice aims to bring peace, comfort and dignity to patients and families facing the crisis of serious illness. 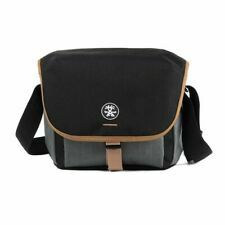 Crumpler Threeseven Daily Medium camera bag - excellent condition. Never really used out and about, but it's a lovely bag with a removable configurable inner padded liner. A few minor marks, but generally in excellent condition. 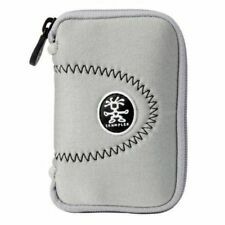 Crumpler Accessory Case. 30 year warranty (yes, THIRTY YEARS) provided by Crumpler. Made from tough padded neoprene. Removable shoulder strap. Red Crumpler Muffin Top 3000 Camera Bag. Condition is Used. Dispatched with Royal Mail 2nd Class. Crumpler jimmy boo 300 Camera Case. Condition is Used. Dispatched with Royal Mail 2nd Class. I used this case for about 2 years but it's still in good condition. It can fit a dslr with his regular lense. It can be worn on the shoulder or also arround the belt. Crumpler Camera bag - Muffin Top 3000. Condition is Used. Dispatched with Royal Mail 2nd Class. Olive Green colour. Sold as used but in excellent condition both inside & out. Crumpler Black Bag, Cupcake 1500. Used once. I think cost £29.99. Velcro closure. Large adjustable double over/shoulder strap. Small front zip pocket. Dividing Velcro section inside, which can be taken out. Crumpler Quick Delight Toploader 150 sailor blue. Condition is New.. opened bag for photo of actual product. All tags attached. Dispatched with Royal Mail 2nd Class. So very nearly new Crumpler Muffin Top 3000 Padded Shoulder Camera Bag/Case. Condition is Used by very very good. Dispatched with Royal Mail 2nd Class. There are two moveable internal dividers. The label inside says Ben's Pizza (XL) The front flap fastens with an adjustable clip and the shoulder strap can also be adjusted and has a substantial shoulder pad. 'Prince Charles' protective ears. It also allows you to comfortably carry the bag without it ever getting in your way. Loop on the back for attaching to a belt. Key Features Extra soft lining inside. I have included photos of the two together for information. 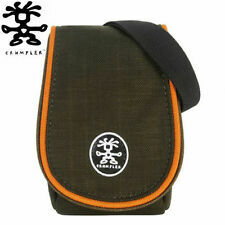 Crumpler Small Camera Bag - The Crisp E 950 - New Without Tags. Condition is New. Navy Blue with Pale Blue and Orange Details. From a smoke free home. Crumpler camera and laptop bag i have carried a 15" laptop in the bag as well as two lenses, camera and flash. I paid over £100 for this bag so its as you would expect a top quality bag made by Crumpler and comes with that little extra pouch. I am only selling this to put the money towards a new one that cost £200 otherwise i wouldnt sell it. Its served me well and is still in fantastic condition. Check out my other items you may like what you see as well as another Crumpler lolol. Be sad to see it go but its got to so happy bidding all the best Ken. 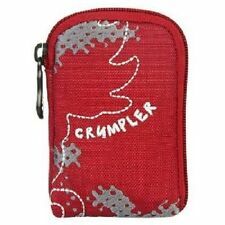 Manufacturer: Crumpler. Super soft and glossy neoprene suit for your short zoom DSLR. Color: Navy Blue / Silver. Crumpler large camera backpack "The Royal Court” In excellent used condition. Hopefully pictures show details but has one main compartment with laptop storage and second with zipped pockets. Two Lowe compartments and small side pockets. Minor wear on back padding. Any questions please ask. Will send via Hermes signed for but couldn’t see that option. CRUMPLER BLACK COMPACT CAMERA/MOBILE POUCH WITH STRAP. Condition is Used. Dispatched with Royal Mail 2nd Class. Never used so in immaculate condition. Internal pocket. Padded inside for protection. Blue & soft Orange inner. crumpler camera bag. Condition is New other (see details). Dispatched with Royal Mail 2nd Class. Manufacturer: Crumpler. Super soft and glossy neoprene suit for your short zoom DSLR. Color: black / steel gray. 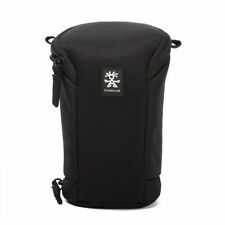 Crumpler Drewbob Pouch 200 Black. An excellent, lightweight protective bag for a compact camera. Two extra internal pockets for memory cards, cleaning cloth, etc. The bag has a shoulder strap and could be fitted onto a belt or simply carried. Which I now no longer need. UK sales only. crumpler camera backpack (large). Condition is New. Very nice and strong bag to protect camera and equipment. Top quality. Lens Hood Accessories. Bag Accessories. Internal slip pocket, Detachable belt loop. General interest. Filter Accessories. View new listed. Gallery view. BRITE-R Hide all sub-categories.